Beautiful yarn cakes for my latest project. The most important reason for swatching is, of course, to make sure that your finished project turns out the right gauge and therefore size. If you are making a fitted garment, this is actually quite crucial. Knitting is both a time-consuming and expensive endeavor and no one wants to come to the end of a project and find out that the sweater you labored over in expensive, beautiful yarn is either too large or too small to wear. Talk about disappointing. When a pattern gives instructions for knitting a swatch it will indicate a suggested size of needles to use and the phrase “or needle required to obtain gauge.” The pattern designer had a certain size of stitches and number of stitches per inch in mind when creating the pattern and this is called gauge. The same yarn knitted on a smaller needle will yield a smaller garment with smaller/tighter stitches. A larger needle will result in a larger garment with looser stitches. This means that you may need to go up or down a size of needle to get your swatch, and therefore project, to be the right gauge and turn out the right size. 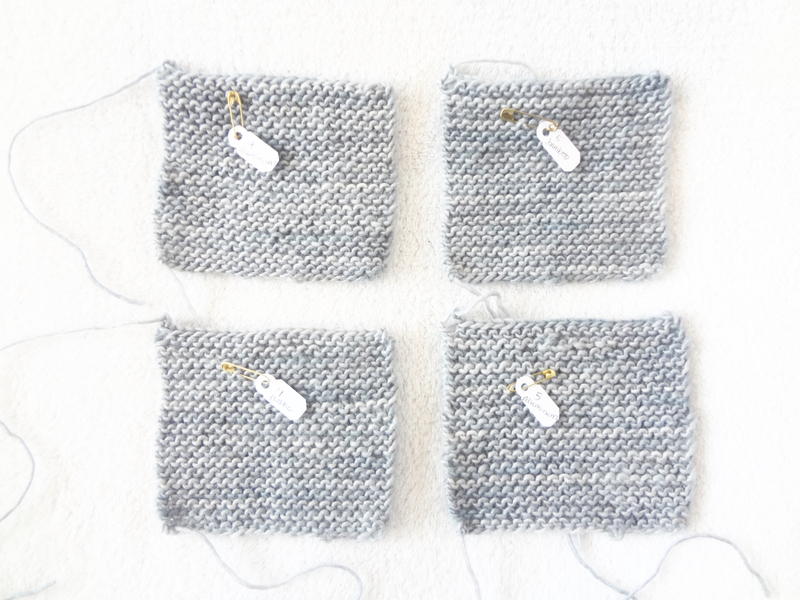 The swatch instructions will tell you what size working a certain number of stitches over a certain number of rows should yield. For example, my current project says: 22 stitches & 36 rows = 4 inch square. It is important to note that the swatch must be done in the stitch to be used in the project, in this case garter stitch. 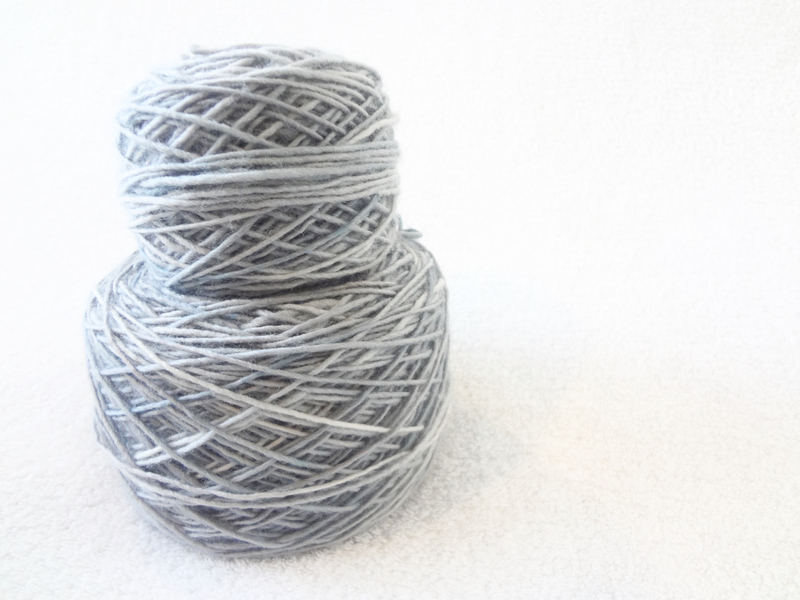 Knitting this yarn on bamboo needles yields a tighter gauge than metal or plastic needles. But not everyone knits at the same gauge for a number of reasons. For example, I tend to knit a bit loose and usually I have to go down a needle size from the recommended size in order to obtain correct gauge. The technique used in knitting, combined with how much tension the knitter puts on the yarn, and the size of the needle all affect the gauge. But, did you know the kind of yarn and the material the knitting needles are made of can also affect gauge? Aluminum and steel needles are the smoothest needles. Plastic needles are almost as smooth as metal. Bamboo and wood needles, while appearing very smooth actually put a little more friction on yarn than the other materials. Certain yarns, especially those with silk, cashmere, or alpaca tend to be more slippery in feel and slide through the fingers more easily when knitting. It is harder to keep good tension on these yarns while knitting. When combined with slippery needles such as metal ones, your knitting can end up looser than usual. 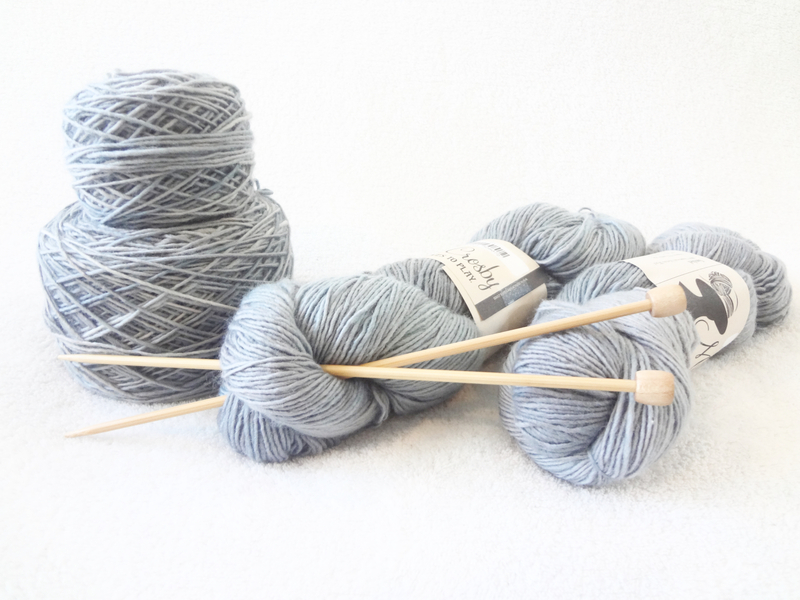 In order to obtain the correct gauge with silky yarns you may need to go down a needle size or switch to bamboo or wood needles to help you keep control of the slippery yarn. In contrast, other yarns, especially fuzzy wool yarns have more grabbing power. When knitted with bamboo or wooden needles, the resulting gauge may be tighter than desired. In that case, you would want to go up a needle size or switch to needles with less friction such as aluminum or steel. The top left swatch was knitted on aluminum US 4 and the top right with bamboo US 5. They turned out exactly the same size, as did the lower left on plastic US 4. The aluminum US 5 turned out slightly bigger, but still not equal to recommended gauge. 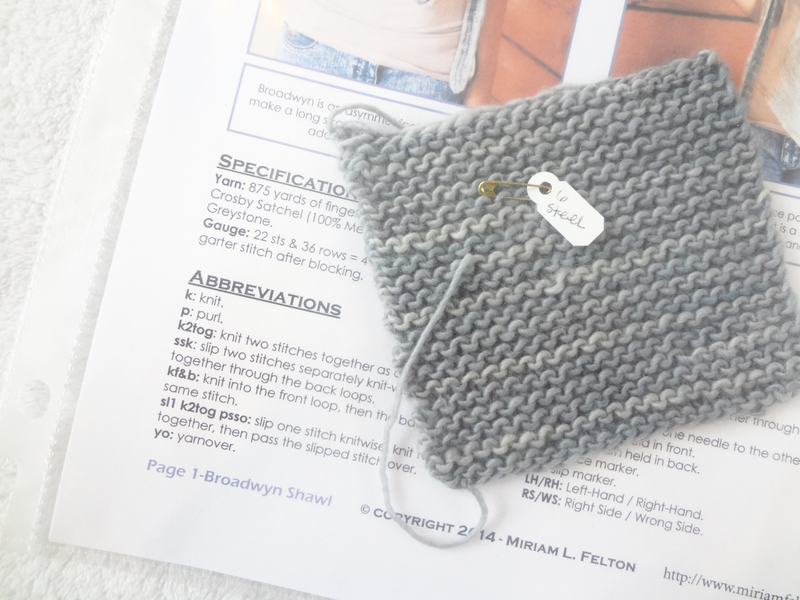 Knitting a gauge swatch can help you determine the correct type of needle for your project in addition to the right size. 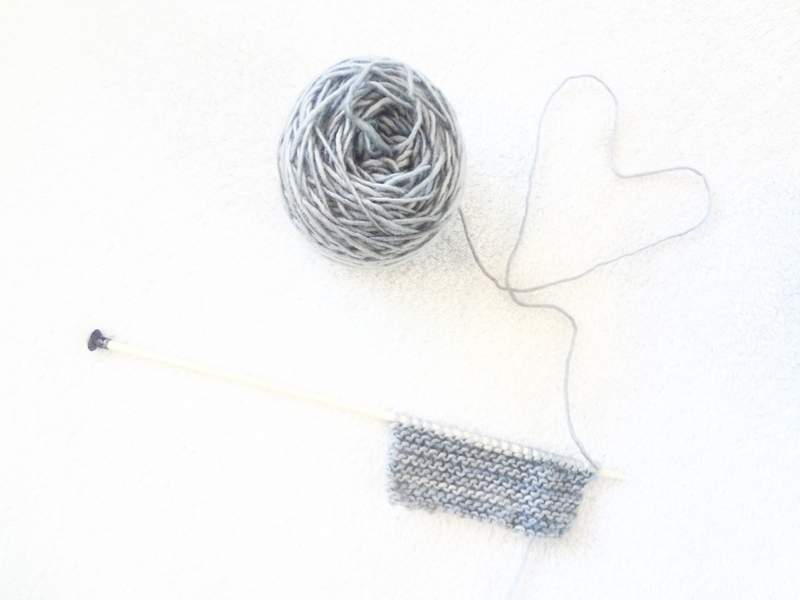 Taking a half hour or so to knit the swatch can save you ripping back a project that is difficult to knit (or unhappily persevering instead of enjoying the knitting) because of incorrect type of needles, or worse yet, the project turning out the wrong size. To my surprise, the first swatch I made with the recommended needle size was too small. Remember I usually need to go down a size. So, I tried one size up, also switching from plastic to bamboo. This change yielded a swatch exactly the same size as the first one, due to the additional friction on bamboo needle. By this time, I knew I wanted to use metal needles with this yarn. It took two more tries, increasing in needle size each time, to finally obtain the 4 inch square. Seems a little silly since I am making a shawl scarf that technically will fit no matter what. But I want it to turn out like the pattern photos and be good and wide at one end, so the proper gauge is important to me. My swatch epiphany… file it with the pattern to enjoy and for easy locating if ever in need of the yarn for repairs. But the funny little thing that really convinced me to swatch was the idea I ran across somewhere (I have no idea where) to save your swatch and file it away with your pattern and yarn wrapper when the project is complete. The reason for this was that you would always know exactly where to find a bit of matching yarn should said garment ever need repair, and the wrapper would have the yarn info such as fiber content, company info, and washing instructions. This makes so much sense to me! Leftover yarn gets used up in other projects or given away or shoved to the back of a closet never to be seen again. But this — this little miniature afghan — gets a place of honor, filed in a plastic sleeve in a binder where it can be seen and appreciated when browsing project files, and even pulled out handled and enjoyed again as pleasant feelings of the project emerge along with memories. (We fiber types are nothing if not visual, tactile, and sentimental.) And there it is, easily located if needed for mending. As always, enjoy and keep warm! Sara, you blow my mind. I always swatch when I’m making a garment that needs to fit but not scarves, ponchos, shawls, baby blankets, etc. But, never in my wildest dreams did I consider the needle material. I don’t really like metal needles because there’s too much of a chance that I’ll loose a stitch. With plastic, I feel more in control. And I’m totally in love with bamboo but don’t have many so, therefore, don’t work up too many projects with them. I love the pattern file instructions too. Super manic neatnik. You guys are completely talking Greek to me! I am amazed at all the complexity that goes into knitting. I haven’t picked up a knitting needles since I was a kid. My daughter however, goes on Youtube and makes these incredible scarves! Thanks for giving me some insight on the different outcomes with the different needles that you use.